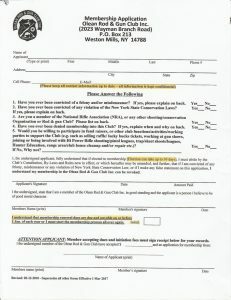 To become a member of the Olean Rod and Gun Club, call John Fahey at 716-474-0505 to setup an interview. Attention Club Members – Annual Dues of $35 are due October 1st of each year and if not paid by December 31st, the locks will be changed. You will no longer have access to the facilities and it will cost you $50 to re-join as a new member. Dues may be paid at the monthly meeting or if you are unable to attend a meeting, you can mail them to the Olean Rod and Gun Club, P.O. Box 213, Westons Mills, NY 14788. 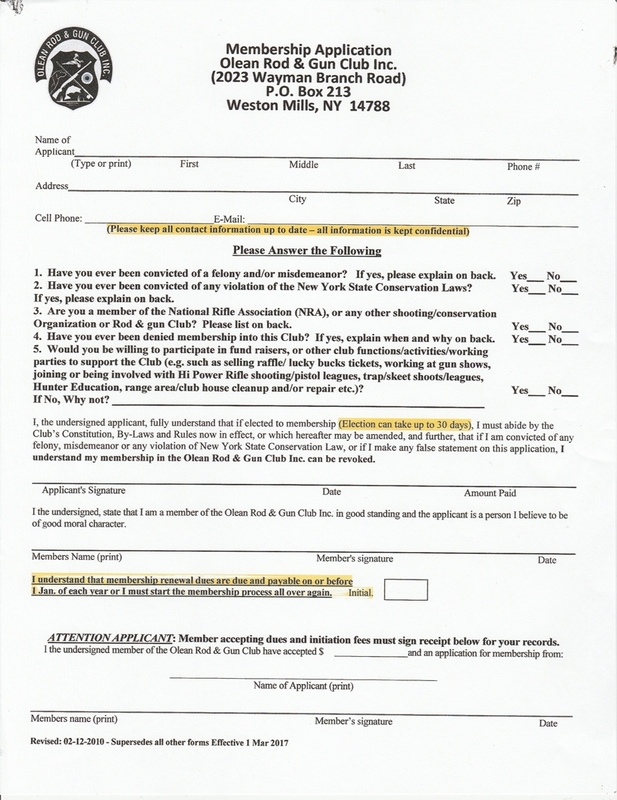 The following Membership Application may be copied and printed if desired. After completing the application, it must be returned to a club member with the required fee of $35 plus $15 for initiation or you may bring it to a monthly meeting which occurs on the first Monday of every month at 7 PM.